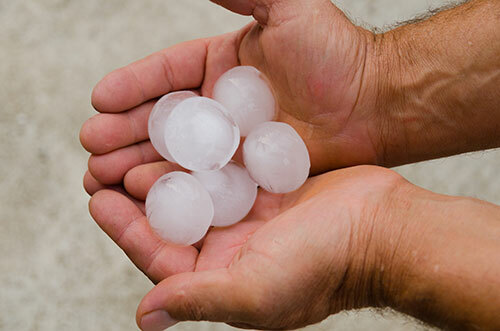 Hailstones can cause irreparable damage to your property. The sooner you address and treat these issues, the better. After the storm has passed, contact the professionals at New View Roofing. We’ll assess the damage and treat any affected areas accordingly. You can rest assured that we will restore your roof efficiently and professionally. Dented metal components – After the high impact of hailstones, certain metal components of a roof – such as gutters, flashing and downspouts – will be left with dents. Bald spots – When hailstones hit a roof, they can dislodge and loosen the ceramic granules that protect asphalt shingles. This will result in noticeable “bald spots” on the roof. The granules will then collect in gutters and downspouts. Fractured shingles – During a storm, hailstones can hit the asphalt shingle mat so hard it results in cracks. When water enters these gaps, it will seep into the underlayment and cause severe leaks.If you notice any of these signs, it’s important to contact the hail damage restoration specialists at New View Roofing right away. We’ll treat existing damage and take preventative measures to ensure your home is protected before the next storm hits. New View Roofing is a full-service roof restoration company that specializes in roof replacement, roof repair and more. In addition to hail damage, we also address storm and wind damage to residential and commercial roofing properties. We’re dedicated to providing high-quality services that restore your roof back to its pre-loss condition or better. If your property has suffered hail damage, be sure to address the issues right away before they worsen over time. A professional from New View Roofing will be on-site within 24 hours of your request. Call (469) 232-7220 or fill out our online form to arrange your storm damage repair estimate.